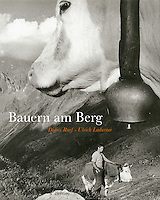 The project about Swiss Alpine Farmers became in 1998 a book published in Switzerland by three different editors : Bauern am Berg, Offizin Zürich Verlags-AG. Paysans de nos montagnes, Editions Monographic, Sierre. Vita di montagna. Edizioni Casagrande, Bellinzona. 24 x 30 cm. 208 pages, Duplex. 127 B&W pictures by Didier Ruef. Texts by Ulrich Ladurner. As an introductory note, this question, heavy in consequence and filled with uncertainty. Are the mountain farmers going to disappear ? From cantons Uri to Ticino, from Grisons to Valais, this race of men has modeled the image of Switzerland. With their flowery beards, traditional costumes and archaic tools, they are the guardians of the mountain, confronted daily to its threats and dangers - erosion, landslides and avalanches. Stuck between tradition and modernity, high subventions and imposed prices - hardly covering their living costs, prices which are ostensibly too high against international compétition - will these slave laborers of the land be able to maintain their ancestral tasks, or are they merely destined to protect the mountains and abandon their productivity - become gardeners in their own right ? Are we witnessing the last generation of mountain farmers before the final exodus towards urbanism or towards other lands in other countries presenting more opportunities. This photographic project makes no claim in answering these questions. On the contrary, it is geared at keeping alive the debate on the survival of this rural alpine world in the future. By focusing on its realities and way of life - landmark of the swiss history and culture -, this visual research becomes a photography of mountain people - the farmers - and their daily existence kept in rhythm by the seasons. A species bound for extinction or survival? Only the future will tell.